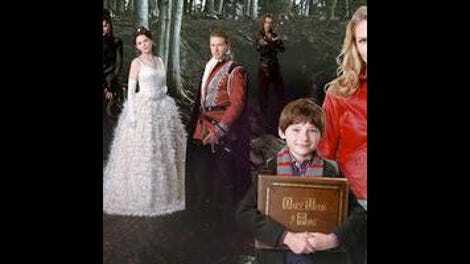 Why does Once Upon A Time have to be so infuriating? The quality of the series varies wildly not just from episode-to-episode, but from scene-to-scene. Jack The Giant Slayer is about to open in theaters, and this show taps into the fairy tale’s boost in popularity by spotlighting Anton the Giant for an entire episode. After starring in one of this show’s worst stories, Anton is brought to Storybrooke by writers Christine Boylan & Kalinda Vazquez, who have Cora pull him from the fairy tale world, shrink him, and put him in a cage on Captain Hook’s ship. Meanwhile, Rumpelstiltskin leaves Storybrooke to find his son, Regina has returned to being a full-on villain, and there’s some forward movement with the mysterious stranger who crashed into town two episodes ago. It seems like a lot of wheels are in motion, but the acting and writing are so inconsistent that it feels like not much is happening at all. Like Anton’s debut episode, “Tiny” suffers from some majorly bad acting, mostly from anyone that is directly related to Anton’s story. Casting the very large Jorge Garcia to play Jack’s giant is a decision that works on paper, but Garcia isn’t very good at playing intensely aggressive, bloodthirsty roles. So the writers adjust Anton’s backstory to fit Garcia better as an actor, turning him into an Ariel-esque giant who just wants to be part of the human world. Of course, the giants have cut off contact with the human race because of their violent ways, fearful that humans will exploit the magic beans to bring their carnage to new worlds. When Anton sneaks down to the human world, he encounters Prince James and his lady friend Jacqueline Jack, who trick him into showing them how they can get their hands on the beans. Garcia does solid work as a naïve giant who finds out that some wishes come with a price, but back in Storybrooke, he has more of a struggle as his character is furious and eager to get revenge on Charming. To gain his freedom, Captain Hook betrays Cora by showing Snow, Charming, and Grumpy his ship and setting Anton free, bringing chaos to Storybrooke when Anton confuses Charming for his twin brother. A freshly evil Regina offers to help Anton get his revenge by giving him a piece of a magic mushroom from Wonderland, and he briefly returns to giant size to tear up Storybrooke and give Snow and Charming the type of action-packed foreplay that really gets their blood going. Having Regina back on the dark side is a puzzling decision after a season of successfully putting her on the path of redemption, and Lana Parilla has much more difficulty making her character real when she’s hamming it up as a villain. Regina has become painfully predictable again, and it’s sad to see how easily the writers of this show are able to change the course of a character when they want it to serve the plot. Character is like magic on Once Upon A Time, it isn’t governed by any strict set of rules, and it changes to solve whatever problem the writers have. These characters may be derived from cartoons, but on this series, they’re supposed to be real people with extraordinary problems. Cassidy Freeman has the same problem as Parilla in her role as Jack, but that’s probably more a problem with the writing for her scenes. The actors in the fairyback aren’t quite successful in selling the life-or-death importance of magic beans, and the conflict rings false. Jack and James break into the giants’ castle to steal the magic beans, and Anton has to raze the field to keep them from ending up in the wrong. When his mentor Arlo dies, Anton is given a piece from the beanstalk’s stem that will allow him to grow a new stalk, now he just needs to find a new place to plant it. Guess where he picks? A big problem with episodes about giants on this show is that there’s a need for special effects, and this show doesn’t have the biggest track record. The giant’s castle in the fairyback is a CG environment that’s more than a little rough around the edges, and the effects for giant Anton’s rampage in Storybrooke are laughably bad. When Anton is chasing Snow and Charming down the street, he gets caught in some electrical and telephone wires, and Jorge Garcia is really bad at pantomiming that action in front of a green screen. Anton’s story gets a lot better once his mushroom wears off, and Charming is able to convince him to calm down and join the community in Storybrooke. Jorge Garcia switches into the lovable outcast role he’s best at as Anton offers his magic bean to plant in the town and joins the seven dwarves to fill his need for manual labor. The axe he’s given reveals his dwarf name to be Tiny, the derogatory name his friends used to call him, transformed into a term of endearment in his new home. Part of the reason Regina is so pissed off is because Emma takes Henry when Rumpelstiltskin asks her to help him find his son, but considering there’s an evil witch wandering the streets of Storybrooke (who Regina is helping), Emma is completely in the right here. Unlike Regina, Rumpelstiltskin is a morally suspect character who continues to gain extra layers, and pulling him out of Storybrooke takes him away from his comfort zone and exposes new weaknesses. To board the plane to New York City, Rumpelstiltskin has to take his enchanted scarf at the airport security check-in, and he’s afraid of what that brief period of time away from the piece of cloth will do his memory. He has a dizzy spell that ends once he puts on the scarf, and he chooses to pick a fight with a paper toilet seat cover dispenser to work out his anger. When he tries to heal his hand with magic, it doesn’t work, so now he’s heading to a major metropolitan city with no powers and no idea where to find his son. The preview for next week says that it’s going to be the biggest bombshell in the history of this show, but it’s clearly going to be Neal Cassady, the character played by Terriers’ Michael Raymond-James. They didn’t put Emma with Rumpelstiltskin for Baelfire to not to be the guy who showed up in her flashback. Ruby brings Belle a picnic basket, and Greg chats with her about the crazy things they saw the other night in a storyline that has Emilie De Ravin back as the type of broken, incapable character that she plays best. Hook tries to summon Cora by putting a Queen of Hearts card on the ground. I like that. The two death scenes in this episode are very silly, especially Cassidy Freeman, who gives the best undergraduate death performance on TV this season.